Last week we continued our color studies moving on to the color yeah-lowwwww. Wouldn't you know, we had no shortage of yellow foods in the fridge! 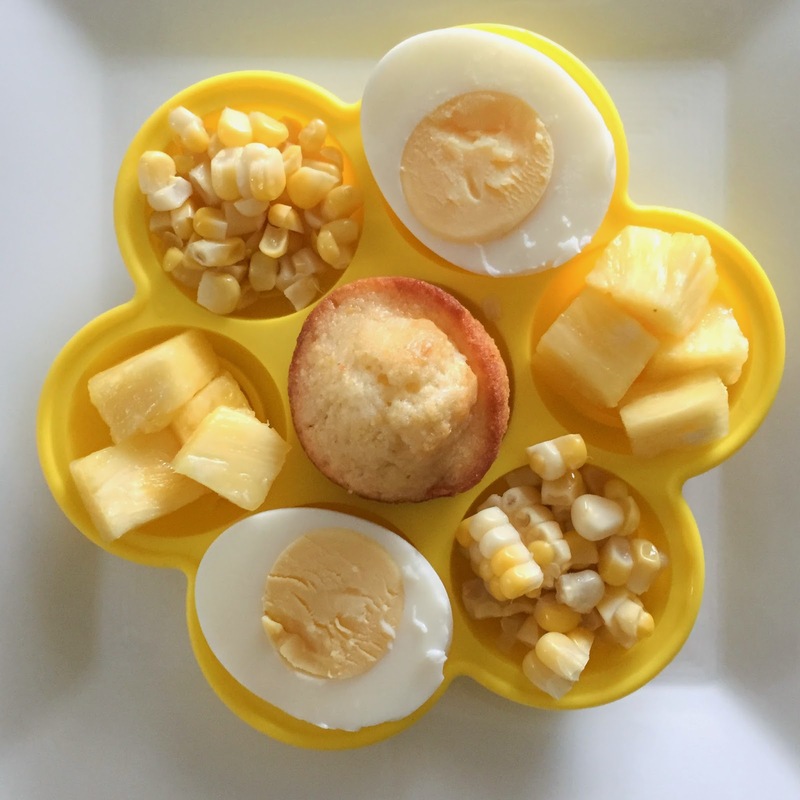 Parker lunched on hard-boiled eggs, fresh corn, fresh pineapple and homemade cornbread muffins, yum. The "plate" I'm using above is actually this ice cube tray I found on Amazon. 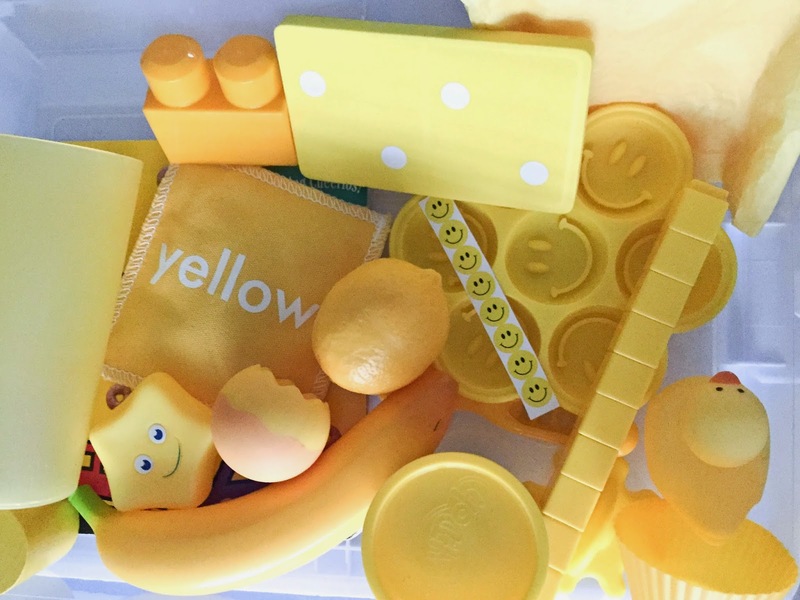 I again pulled out and collected any and all yellow items I could find around the house. We talked about how the items felt and sounded, and of course referenced the color, yellow! 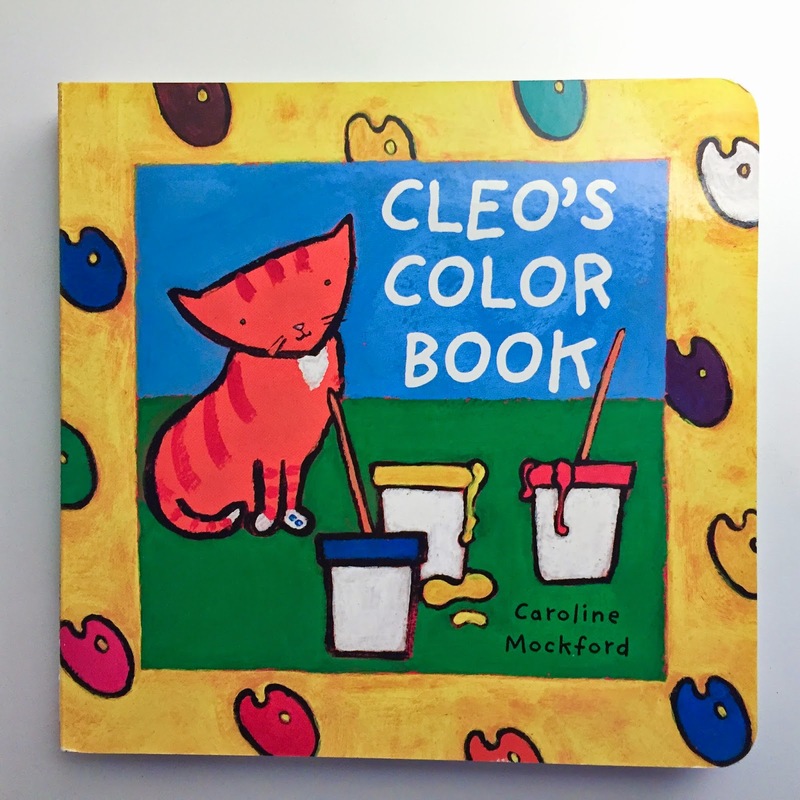 We also love this book about colors. Since we are halfway through the rainbow, it helped reinforce the colors we've already covered and front load for the upcoming ones (which Parker has already just picked up now anyway since beginning our color studies). Bonus, the book has a yellow border on the cover! Our yellow activity was to build a sunshine box to send to a friend. Have you seen this idea on Pinterest? 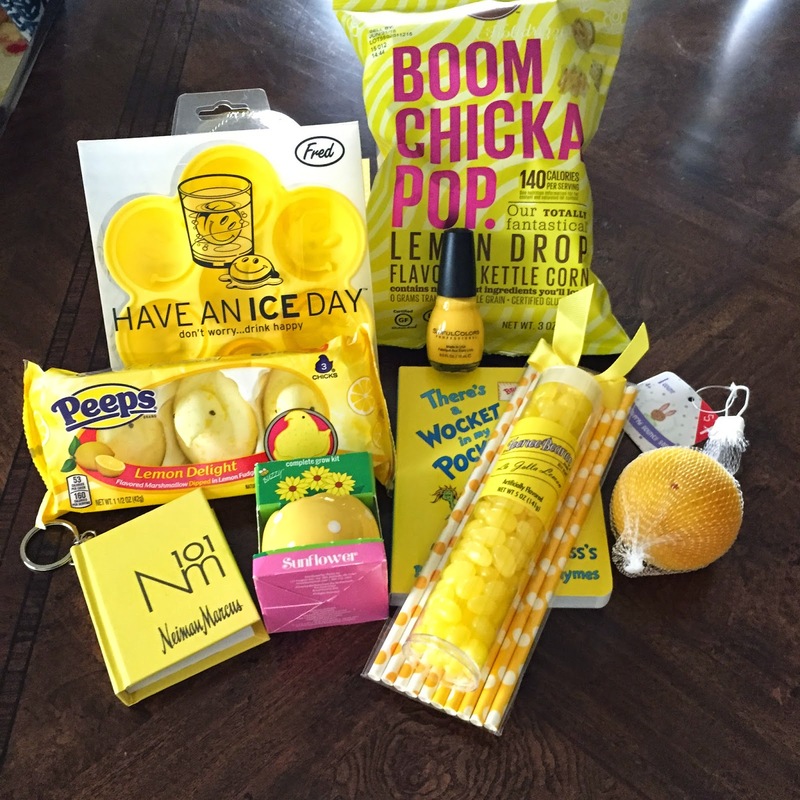 Basically you pile a bunch of yellow items in a box for someone who can use a little pick-me-up. 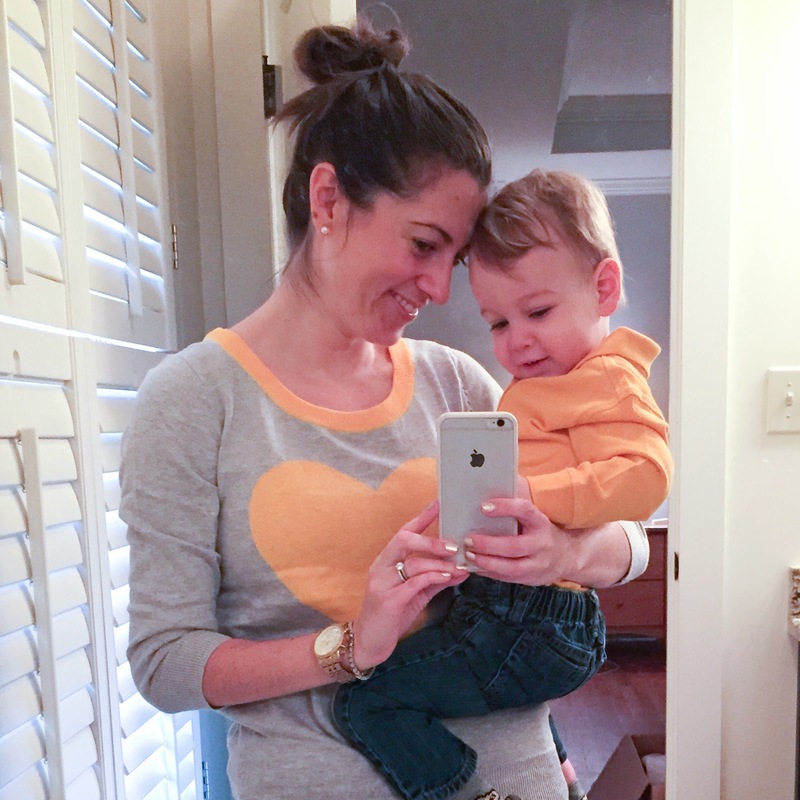 Darling idea, and perfect for yellow week! 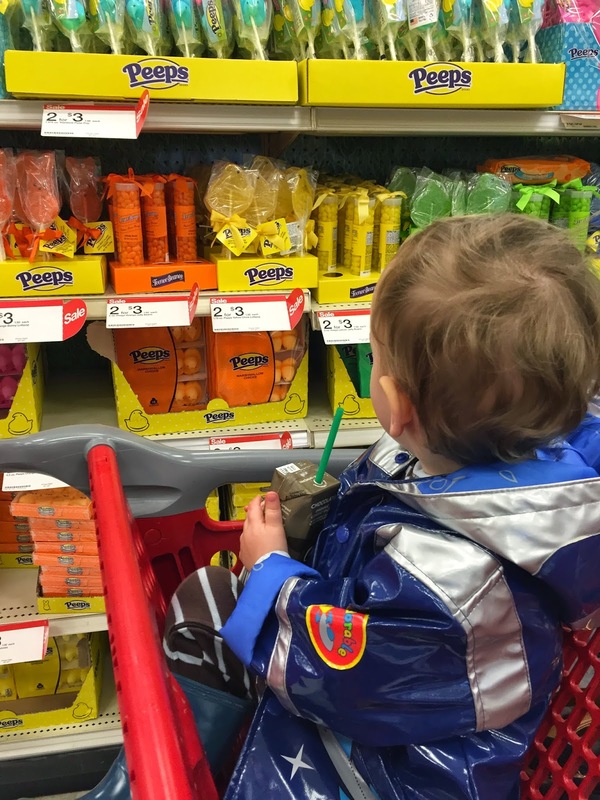 My friend has a son Parker's age, so we had fun going to Target and searching for yellow items a mom or a toddler would enjoy. The Easter section was perfect for finding lots of yellow! Here's our booty from Target. I may or may not have stocked up on the Lemon Drop flavored Boom Chicka Pop for our house, too :) I also included the same ice cube tray I mentioned above that I used as a plate for Parker's lunch. Isn't it darling? I'm excited to make ice cubes with it, too! 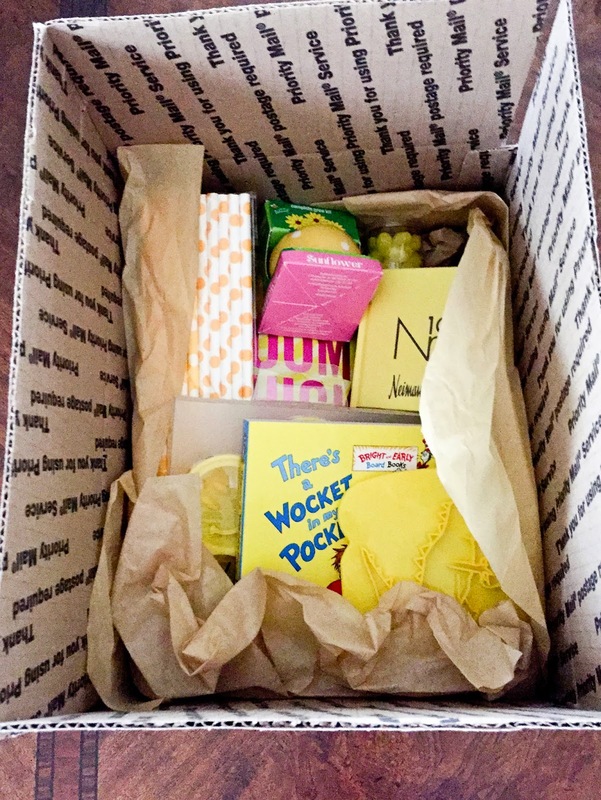 Parker helped me place all the yellow items into a medium-size USPS Priority Mail Flat Rate Box - a perfect fit! 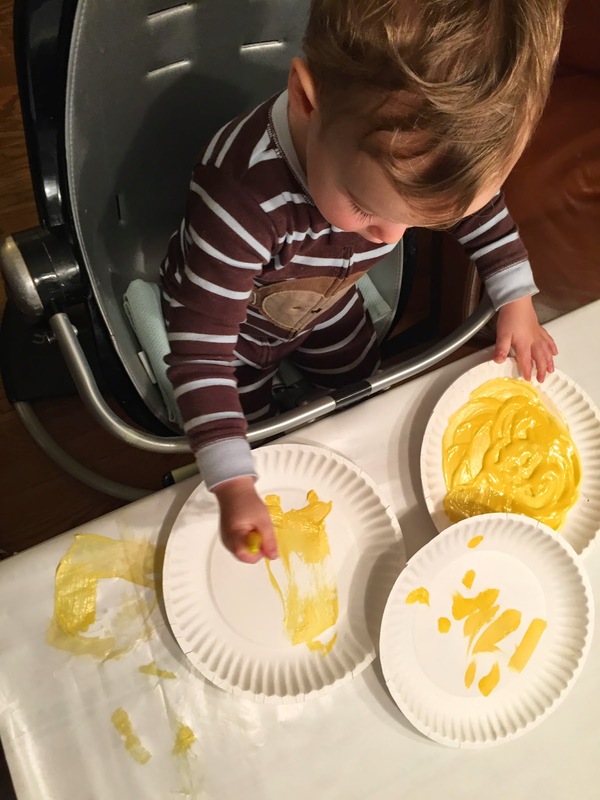 Out of all the colors, Parker can pronounce "yellow" the best, and boy is he proud! I greeted him after a nap on our second yellow day, and the first thing he said to me was "yeeeahhhlooowww!!" - like he had been thinking of the color all nap time long and just couldn't hold it in any longer! Wishing you daffodils and sunshine and everything yellow! I absolutely love this! Each week I get so excited to see what you have come up with!! It's perfect that green week is next week with St. Patrick's Day!!! How clever. Are all his meals yellow? Or just one a week? Thanks, Ashley, it's been so much fun! I emailed you from a different account so hopefully that will fix it :) For the lunches, I just do one all-color meal, but I bring out the color-of-the-week leftovers all week long so we still get practice naming the color when we eat!